DCP185C , DCP385C , DCP585CW , DCP6690CW , MFC490CW , MFC790CW , MFC990CW , MFC5490CW , MFC5890CN , MFC6490CW , MFC6890CDW , DCP145C , DCP165C , DCP195C , DCP375CW , MFC250C , MFC290C , MFC295CN , MFC255CW.
. 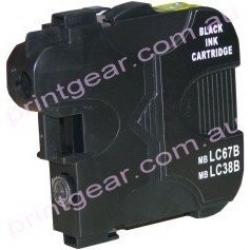 The LC-67 black ink cartridge selling here; as pictured; is the high yield version: 17ml of ink.